"Canine osteosarcoma treatment focuses on tumor control. Amputation of the affected limb is the primary method of treatment, since removal of the tumor without the limb often results in a re-occurrence of the problem, although new techniques for tumor-only removal are continually being researched. Radiation is often used with surgery depending on the location, size and degree to which the tumor is affecting surrounding tissue. Other treatment methods that are used with surgery/radiation are chemotherapy and immunotherapy. Dogs that have had their limb removed continue to live a high quality of life and learn to walk in about a month. Natural remedies as a supportive therapy could help reduce the severity of symptoms and strengthen the immune system." Canine Osteosarcoma treatment is the most common type of bone tumor in dogs, representing 80% of all canine bone tumors). There are several types of dog bone tumors that fall under this definition including chondroblastic, osteoblastic, fibroblastic, telangiectatic, and mixed type tumors. It usually occurs in dogs that are 6 – 7 years of age or older in the legs (called the appendicular skeleton). Larger breeds are more likely to get the disease than smaller breeds with German Shepherds showing the highest incidence. The next group in order of incidence are Great Danes, Golden Retrievers, Irish Setters, Doberman Pinschers and Collies. In order of frequency the disease is found in the front legs, hind legs, ribs and lower jaw (canine mandible). This disease spreads quickly and can move from a tumor on the bone to the lungs. Males are more likely to get the disease than females. The first sign of the disease is usually a limp due to pain followed by swelling. If the pain becomes severe, the dog may stop using the affected leg. Other symptoms include dog limb fractures, bone cysts and bacterial or fungal canine bone infection. Your Veterinarian will take X-Rays to see if there are signs of canine osteosarcoma. For a definitive diagnosis a biopsy (sample) of the affected area will be taken and tested in a lab. To determine the extent of the problem including bone and tissue involvement might be obtained using MRI and CT scans. 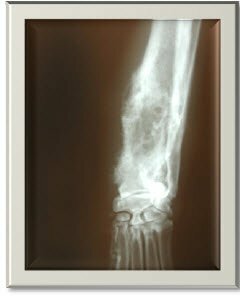 The primary treatment for this disease is the surgical removal of the area such as an entire limb or part of a limb. Limbs are amputated above the nearest joint. Use of chemotherapy (cisplatin) and radiation could extend the life of your dog. Chemotherapy usually begins 2 to 10 days after amputation or tumor removal. Other common drugs include doxorubicin, liposome encapsulated muramyl tripeptides (liposome/MTP) and carboplatin. Dogs adapt well to having 3 legs, with most learning to walk in under a month. If surgery is refused by an owner, radiation therapy over a 3 week period has resulted in improved limb function in 75% of dogs treated. Veterinary researchers are also exploring the use of Immunatherapy, which is an approach with uses the body's immune system to attack cancer cells. When tried, this approach is used after surgery, radiation and chemotherapy have been tried. There is a technique for some areas of the leg (distal radius, proximal humerus, scapula and ulna) where there is an alternative to amputation. Surgery is used to removed the area of the tumor combined with radiation and chemotherapy. Dogs that undergo tumor removal alone (called limb sparing) have a re-occurrence of the tumor 25%-50% of the time. In addition to surgery you might want to consider a dietary supplement designed to bolster the immune system of dog's with cancer. PetAlive C-Caps Formula is made for this purpose. Consult your veterinarian when considering supplements. Many veterinarians suggest stopping the use of supplements 1 week before and after chemotherapy. The site of the tumor is an important factor in determining the future lifespan of your dog. Tumors of the skull/face tend to have a slower impact than tumors of the legs. (www.ivis.org), Ithaca, New York, USA.